While the plain printers have been relegated to a back seat by the all conquering all in ones, there is still a large market for dedicated printers with good print outputs. Epson Stylus Photo R360 comes under one such categories. Epson Stylus Photo R360 is primarily a photo printer and as such the image results are very good. At the enhanced 5760 dpi, the print quality is smooth, without any jagged edges, thought there might be some edges in plain black prints. The print speed is 30 ppm for blacks and 5 ppm for colour, and can be claimed as decent looking at the quality being given as output. The connectivity to computers is only through USB 2.0 which can be slight dampener. Epson Stylus Photo R360 ink cartridges are a total of 6 with Light Cyan and Light magenta, adding to the smoothness and accuracy of the images being printed. The printer itself is a compact unit with input tray capacity of 120 sheets. One distinct feature is the large LCD display, which helps one to take prints directly from various SD cards, and when printing directly from cards, the display also shows a rough estimate of how the photo will look when printed. The connectivity options are many with 2 card slots, a separate PictBridge connection. Epson Stylus Photo R360 is aimed as a photo printer and it does that job really well, with good print quality and connectivity options for cards and cameras. For its cost it is a good value for money printer. How to solve the banding or missing colour problem of Epson Stylus Photo R360 printer? While your printer is not being used for so long, it may be possible that printheads get clogged or the Epson Stylus Photo R360 ink cartridges ran out of ink. Thus, creating several printing and banding issues. Follow the steps below and get rid of the problems associated. Q. If compatible cartridges like Epson Stylus Photo R360 ink cartridges are not newly manufactured, how are components used in it sourced? A. Compatible Epson cartridges are made from recycled Epson cartridges. They are created by third-party manufacturers, who are industry experts, in their own setup. They put the cartridges through strict quality tests and also use only the best ingredients like ink and other components. Q. I believe my colour Epson Stylus Photo R360 ink cartridges are exhausted as I’m not getting colour printouts but the black ink cartridges are still there. Is it ok to print only in black till the time I don’t get new colour cartridges? A. Yes, you can very much print temporarily with black ink till you get new colour ink cartridges. Q. Am I entitled to money-back guarantee if I’m not satisfied with Epson Stylus Photo R360 ink cartridges (Epson T0807) I plan to buy from you? A. Yes, we offer money-back guarantee and a cooperative and friendly customer support department. Q. Will a multipack of compatible Epson Stylus Photo R360 ink cartridges cut costs considerably? For how long can I store cartridges that I may not use immediately? A. Yes, a multipack purchase of the ink cartridges will cut down your cost dramatically; in fact, all the cartridges in the pack carry a larger amount of ink and since they are compatible, their cost is already lower. You can look at huge savings with this purchase. Q. I printed a nozzle check in my Epson Stylus Photo R360 printer (with Epson Stylus Photo R360 ink cartridges in it) and tried cleaning the nozzles also, but I’m still unable to print. What should I do? A. You need to try replacing the ink cartridges you’re using currently if cleaning up nozzles and nozzle check is not helping you. Please do that; it should settle the issue. Q. I installed new Epson Stylus Photo R360 ink cartridges (Epson T0807) in my Epson Stylus Photo R360 printer sometime back. However, I’m constantly getting the message that the cartridge needs replacement. What should I do? A. First, please open your printer and take the cartridge out. Turn the printer off from the main switchboard and keep it like that for about 15 minutes. After that, switch the printer on, reinstall the ink cartridge and take a printout. If this doesn’t sort out the issue, you may refer to the manual or contact Epson Support for alternative measures. Q. Is the Epson Stylus Photo R360 printer suitable for digital photo printing? How many photos can it print and in how much time? A. Yes, this printer is considered the perfect choice for digital photo printing by photography enthusiasts. 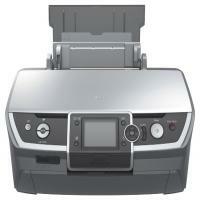 It can print 10 x 15 photos in 13 seconds, comes with memory card slots, a 3.5” LCD screen and more. Q. How much ink is available for each colour of the compatible Epson Stylus Photo R360 ink cartridges? A. The quantity of ink for each colour in these ink cartridges is 7.4ml. Q. Can I use some ink cartridges that are original while others are compatible (for different ink colours) simultaneously in my Epson Stylus Photo R360 ink cartridges set? Q. Which are the new features that make the Epson Stylus Photo R360 printer print professional quality images? A. The new features that have been introduced in the Epson Stylus Photo R360 printer are Claria Photographic ink and Epson Photo Enhance to print perfect photos without any professional help. Q. I installed Epson Stylus Photo R360 ink cartridges now but I can’t close the cartridge cover. What should I do? A. You need to open your printer and check whether all the cartridges are properly seated in it. After that press down on all the cartridges, one by one until you hear them click into place. Make sure you don’t use force to close the cover. Q. The print heads in my Epson Stylus Photo R360 printer didn’t move to the replacement position when I was installing the Epson T0807 ink cartridges. I connected the power cable to the printer properly and switched it on properly, still, it didn’t work. What should I do? A. You’ll see a red ink button on the control panel of your printer, which you need to press. The print heads will move to the replacement position once you do that. Q. I touched the green chip at the side of the Epson Stylus Photo R360 ink cartridge while installing it. I’m not able to get printouts now. A. Touching the green chip can cause damage to the ink cartridges and prevent the printer from carrying out printing jobs The green chip is a very sensitive component, which has to be handled with care. Please clean the green chip gently with a soft, lint-free cloth and then try taking a print out. If it doesn’t work, you’ll have to get a new one now. Q. What is the correct way of placing the ink cartridge into the cartridge holder? A. You should always place the ink cartridge into the cartridge holder with its bottom down and then push it down. Q. Are the “Ink Out" or "Replace Cartridge” messages displayed when only one ink cartridge is empty? A. No, both these messages are indicative of both- one as well as more than one ink cartridge being empty. Q. If I install Epson Stylus Photo R360 ink cartridges (comprising both, colour ink as well as black) and if ink runs out in one of them, will I be able to take printouts? A. No, your printer won’t be able to take printouts in such a scenario. The printer needs both, black and colour ink cartridges, with a certain amount of ink in each cartridge. Q. If there’s a problem with my Epson Stylus Photo R360 printer’s ink pads, will the printer get damaged? A. No. Epson printers stop working if the use of malfunctioning or defective ink pads poses a risk of damage due printers.